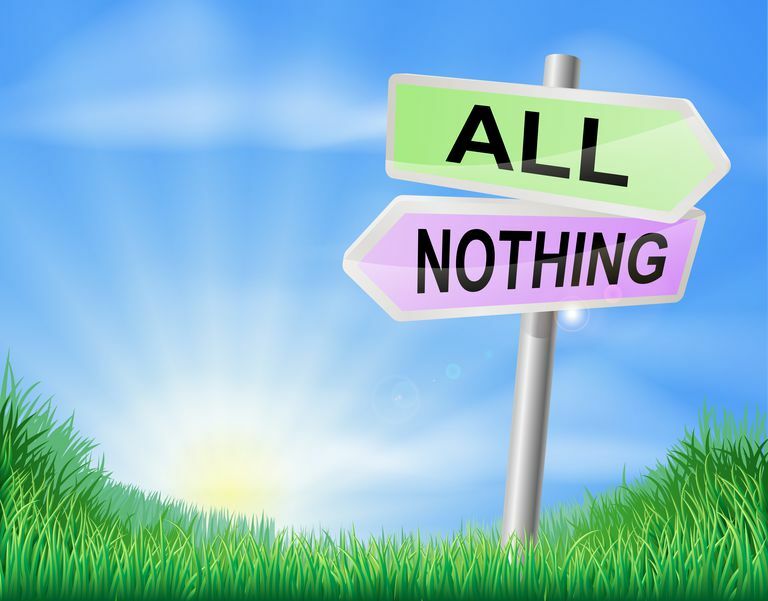 All-or-nothing thinking sometimes referred to as black-and-white thinking or dichotomous thinking, is one of the most common types of cognitive dysfunctions observed in patients with eating disorders such as bulimia nervosa and binge eating disorder. In Feeling Good: The New Mood Therapy (1980), David Burns identified ten different types of cognitive distortions or inaccurate and problematic ways of viewing oneself and the world. Cognitive distortions may lead to negative emotions and problematic behaviors. For this reason, they are a primary target of cognitive-behavioral therapy. Some of the most common examples of all-or-nothing thinking in patients with eating disorders are creating a rigid dichotomy of good versus bad foods (and avoidance of those foods on the bad food list) and defining eating behavior as either good or bad. Let’s look at how this type of thinking may cause problems, such as binge eating, for a patient with an eating disorder. Jane has a food rule that she doesn’t eat candy because it is a “bad food.” Jane gets a surprise delivery for Valentine’s Day: of a box of chocolates. Jane believes that chocolate is forbidden, but she decides just this once, to indulge. Jim often goes out for a burger with his friends from work. When he does, he either gets a green salad (when he is dieting and being “good”), or he has a double cheeseburger, fries, and a shake (when he is not dieting). He notices that when he is dieting and has only the green salad while all his buddies eat burgers, he ends up feeling sad and deprived and sometimes goes home and binge eats ice cream. On the other hand, at the times he eats the double cheeseburger, fries, and shake, he feels ill and berates himself for eating unhealthy. Either way, his rules leave him feeling distressed. Recovery from an eating disorder involves learning to think and live in shades of grey. Living in the grey area means accepting that all foods in moderation can be part of a balanced and healthy diet. It means learning to incorporate fear foods. It means eating in a way that is flexible enough to be sustainable. It means embracing ambiguity. What would this look like for Jane and Jim? Jane could work on relaxing her rigid rule about chocolate being “bad” and working towards all foods being morally neutral. She can acknowledge that different foods have different nutritional values, but all can be included in a balanced diet. Once all foods are permitted, it will become easier to stop after a normal portion and she won’t have to face the distress of breaking a rule. She can learn to have a few pieces of chocolate and enjoy them. Jim could learn that he doesn’t have to vacillate between restricting or overindulging when he is out to eat with his friends. If he wants to have a cheeseburger, he can have a single cheeseburger with a side salad. This way he will likely not feel deprived but will be able to enjoy a more balanced and satisfying meal. He will ultimately be relieved of the shame of binge eating. Challenging all-or-nothing thinking can be scary, but it is an important element of recovery. It is important to note that addressing dysfunctional thoughts such as all-or-nothing thinking is but one element of cognitive-behavioral therapy, a leading evidence-based treatment for eating disorders. If you or a loved one is experiencing an eating disorder please reach out for help. Trained eating disorder professionals can help you develop more balanced thinking and healthy eating behaviors. Burns, David, 1980, Feeling Good: The New Mood Therapy .